Do you know your family history? Are there accounts of your ancestors which have been handed down from one generation to the next? Have you spent time researching your family genealogy? Are you able to see God's hand through your family's history? My sister has researched our family history quite a bit. She discovered how some of our family came to America on the Mayflower and another ancestor was shanghaied from his home in Scotland, brought to America and sold as an indentured servant for seven years. By choice, or not, my relatives ended up here in America and looking back I am able to see God's hand. I share the family history with my grandsons, because I want them to know their family history, but more importantly, to help them see how God's hand moved through the generations to put them here where they are now. I want them to see God has a plan for them! Psalm 102 talks about our descendants being established before God - I want this for my grandsons. I want them to be able to see how through the generations, God has been at work. I am intentional about sharing with them how God is working in our lives today, too! I want them to learn how to see the many ways God is at work in their lives, as well! 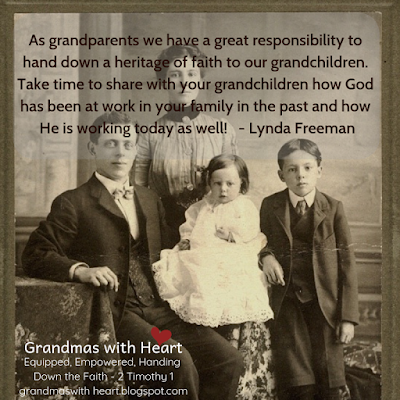 As grandparents we have a great responsibility to hand down a heritage of faith to our grandchildren. Take time to share with your grandchildren how God has been at work in your family in the past and how He is working today as well!